SABDA is a unit of the Sri Aurobindo Ashram Publication Department. The Sri Aurobindo Ashram Publication Department publishes the works of Sri Aurobindo and the Mother and works by disciples on their life and teachings, in over 15 languages. The Publication Department's distribution unit is SABDA. Apart from the Sri Aurobindo Ashram publications, SABDA also distributes books of other publishers with related content. 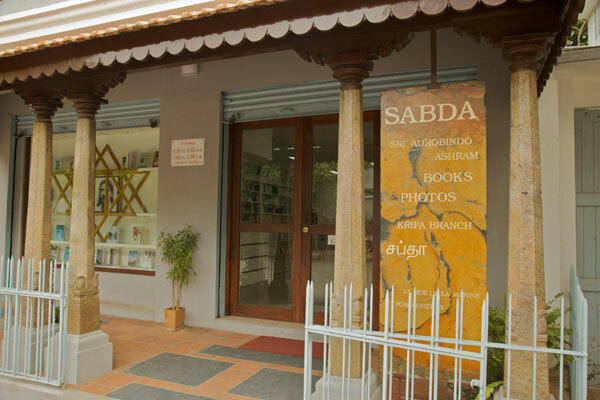 SABDA has two retail outlets, Service branch inside the Sri Aurobindo Ashram main building, and Kripa branch diagonally opposite it. The head office of the Publication Department and SABDA is at 17, Rue de la Marine (next to our Kripa branch). Head Office: 8.00 a.m. to 12.00 noon, 2.00 to 5.00 p.m.
Kripa branch: 8.30 a.m. to 12.00 noon, 2.30 to 6.00 p.m.
Service branch: 8.00 a.m. to 11.45 a.m., 2.00 to 5.45 p.m.